and guiding line in all the many mediums of her creation. From her fashion and wearable art, to both Analogue and Digital paintings. Marmite Sue makes OOAK costumed porcelain dolls and custom porcelain dolls. Her dolls feature detailed body blushing, elaborate wigs, and carved body details that blur the line between human anatomy and fashion. 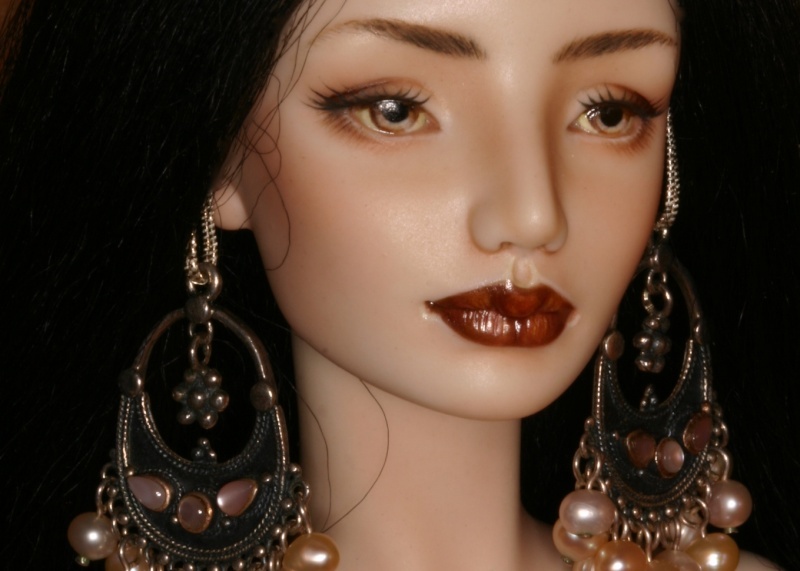 Her porcelain dolls are strung with stainless steel springs. Marmite Sue has several lines of porcelain dolls. I am not sure of the sizes of all of them. I believe the thin, adult looking body is about 40 cm, and the Milk style bodies (more childlike) may be larger. Marmite Sue also produces a line of resin Angel Egg dolls. Thread for them located here! Btw I think the Milk type bodies are about 50 cm tall. Oh thank you for the info! I had remembered them being bigger but I couldn't find the measurements anywhere. WOW, look at this fabulous new creation from Marmite Sue! 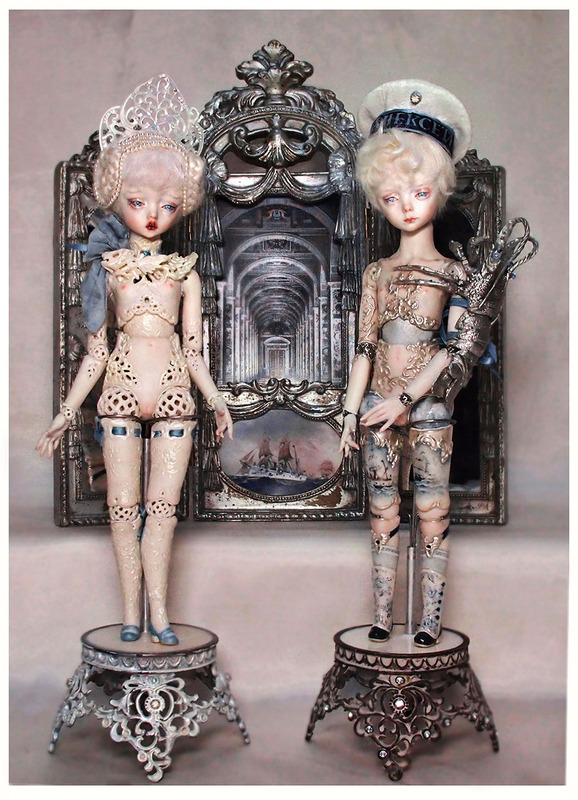 "Charlotte is on her way to Miami, and will exhibit next month at the Bazel Art Fair....She is a 52cm porcelain `Faberge` type doll with a Music box mechanism installed in her stomach, turning a 3cm tall carousel at her upper waist....For inquiries about her please contact Copro Galley directly." A true work of art ! What more is there to say? Her craftmanship is so way on top of any other porcelain doll artist (and yes, I also mean ED dolls, which are quite simple -very beautiful yes, but the making of Angel Egg dolls is so much more complicated and they are totally unique). I completely agree with you. Her work never ceases to amaze me and she has reached another level of perfection. Her work is just incredible, always! Gallery worthy pieces for sure! Such intricate work! I always marvel at it because I know how hard it is, to do all that cutting and carving, one false move and, you start all over again! Also her larger dolls are amazing! Very detailed. Yes, much, much more work and innovation than ED. The cutwork and her painted on scenes are fabulous. True works of art. These dolls have a unique look to them. I suppose they are going to be made in resin to make them available to more collectors at lower prices, but I don't know if they will have the same luster of the porcelain dolls. They are beautiful. I've only seen one of her dolls and honestly don't know if it was porcelain or resin. It was at a sales booth at the Austin BJDC (convention). I meant to go back and ask more questions when the booth owner was less busy but didn't make it back there. Because we have so few porcelain BJD in the US, it's hard to get to see them. 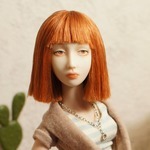 I own five of her resin dolls and I always marvel at their posability; her craftswomanship is incredible. My dream is of course to own one of her porcelain dolls especially with the new slip she's developed but I fear the price will put an end to it. I've never been to a doll convention but as far as I know porcelain dolls are quite rare in the few conventions we have in France too. Maybe that will change with time as they grow more popular. BTW Eli's porcelain dolls are surprisingly absent from this forum; does any member here own one of them, or are they that rare? All of my porcelains are antique dolls and up to late l990s. My feedback from artists was that resin was easier as each layer didn't have to be fired and collectors felt it was less fragile. A few artist continued to create them as "art" dolls, but only recently have they started showing up in a "fashion" size. Do you own an "Eli"?